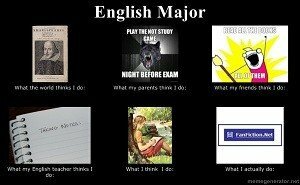 What comes to your mind, when you think about English majors? First of all, the question is about the most difficult fields in the Humanities area. Why? The point is that English studies include much more elements than just grammar. This area studies everything that is relevant to all fields such as critical thinking, education, understanding literature and critical thinking. Come up to any English majors students and take a closer look at him. You will see that these students are the ones, who are the regular customers at Starbucks and who suffer from insomnia. Complete weirdos of the class, they have particular things that only English majors student’s brain can get the sense of. Complete Silence Is what Matters the Most! These students do not need much talking. They prefer silence to have an opportunity to ponder over what they are reading. They need to spend some time with their thoughts and idea. That is why you can see them more than often reading in silence. Taking into account the fact that English majors have extensive experience with analytic linguistics, they usually over-analyze the behavior of their mates and, as a rule, that’s already a habit. They spend a bunch of time wandering through the pages of works of William Shakespeare and Emily Brontë and thus, they feel like they know the authors just like they are hanging out with them. Selling a Book? God, No! Do you know that all the subjects that English majors deal with are interconnected? That is why it is absolutely pointless to ask the student to sell his / her book unless he / she is done with the university course. English majors are usually in a sort of frustration whether they would like to build up the career of novelist or whether their destiny lies in the publishing (or any other) field. Sometimes they come to understanding that the course they are taking brings less payment or even unemployment (in comparison to the other areas). The Library Is Closed? Panic! As you already know, local library is the second home for the English majors. That is why seeing the “Closed” or “Under Construction” signs is equivalent to an apocalypses. It doesn’t matter whether they receive money or not, they are always required to perform the proofreading task regardless of the length of the paper. The English majors are more than sure that when they visit any place in Europe, they will walk in the same streets as their favourite writers did. They feel like Europe is a completely new world for them, where one can literally walk through the history! Got a New Book? Smell It! This is what every English major does when he / she has got a new book on the shelf. They are addicted to the scent of a new book and feeling its smell is a tradition. All in all, English majors are the most romantic and the most thoughtful among the other students. Try to get to know them better and, who knows, maybe one day they will let you into the new world of Austen and Shakespeare.